ARE YOU READY FOR THE SPIN OF YOUR LIFE? If you haven’t already taken part in OJO’s awesome Reel Spinoffs, first of all – WHY NOT? And second of all, wow are you in for a treat! When you take part in OJO’s Reel Spinoffs, not only do you get to play all your fave slot games, but you get to compete against your fellow OJOers for some really incredible prizes. Watching yourself climb up that leaderboard is seriously edge-of-your-seat stuff and that’s why we think that Spinoffs are the absolute ultimate play-time fix! Spinoffs are happening 24/7 at OJO’s! Just go to the “REEL SPINOFFS” tab on the left-hand side menu and you’ll find a list of all the spinoffs that are already taking place. You’ll also see future spinoffs and when they are due to start, so if something hasn’t started yet that tickles your fancy, you can plan ahead! You’ll be able to see the cost of the buy-in, how much longer the spinoff is on for and also how many players are currently taking part. After you click “Join” you’ll be directed to the rules and instructions panel – when you’re ready just click “Buy-in” and you can choose whether to pay with your balance or via deposit. Spin your way to the top! Once you have bought into a reel spinoff, OJO will send your spins to the ‘Reward’ section where you can collect them. Just click “CLAIM NOW” and then it’s time to play away! Spin your little heart out as you envisage yourself climbing up the leaderboard for those sought-after positions! You can check in on your position at any time by clicking “View” on the spinoff you’ve entered. You can also buy in as many times as you like and then watch as you keep climbing higher up the leaderboard! Prizes to write home about! There are always great prizes up for grabs in OJO’s Reel Spinoffs – from Free Spins to Cash Rewards, there is always a great reason to go for a spin! Look out for those mega prizes of OJO’s too. Past winners have walked away with some incredible VIP Packages, including a VIP Tennis Experience, Backstage Music festival tickets and even a Mini Cooper! And that’s not to mention the very generous runner-up prizes that are definitely worth the extra mile. Look out for our next mega prize Reel Spinoff where you can actually win Anthony Joshua VIP Tickets for you and a friend over at OJO’s “Big Fight VIP Tickets!” Spinoff. It will be running from 3rd – 9th September so look out for it! There will be loads more KNOCKOUT PRIZES up for grabs too! Join the Spinoff fun and who knows what you might be winning today?! 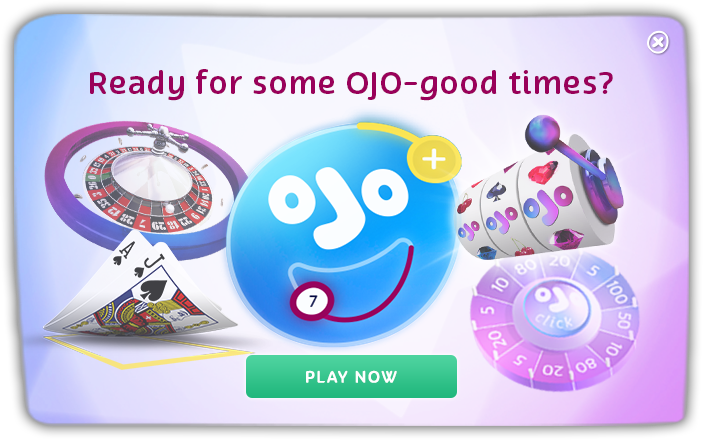 OJO – A CASINO THAT’S ALL ABOUT THE PLAYER!